Do the Tories have shares in IPSOS MORI or maybe whoever it is that prints election pamphlets? They do seem keen to send a lot of business their way these days. Anyway, another election. So let’s think about what we might be able to vote for. An elected individual who fights for what is good for the people and whose views are immune to those of special interest groups or the press. An elected individual who fights for the views of special interest groups and the press and whose views are immune to what is good for the people. If I were assessing Theresa May, I’d be giving her a 0/10 on the first definition and a 10/10 on the second. Both paths can lead to political success but in fairness to Theresa, the second one is much, much easier. In the first one, you have to properly understand myriad complex issues, explain these to voters in terms that they may understand, form policies based on them and explain how these policies address these issues. You have to continually measure how your policies are doing and adjust them based on the evidence. It’s really hard work. In the second one, you just need to read The Sun and The Daily Mail every morning and just do what they said, safe in the knowledge that it will be popular with an awful lot of people. Sure it means that Rupert Murdoch and Paul Dacre are effectively running the country but look how popular you are with such little effort! Theresa is calling an election because she is way ahead in the opinion polls. Let’s not kid ourselves with thinking there might be anything more altruistic than this. She believes that, in current circumstances with no coherent opposition, she can get a huge majority for the next five years. She is probably also more than a bit concerned about what the electorate will think when they start to see the reality of what she will actually get in her negotiations with the EU. Didn’t work out for David, did it? Better to do this now, before reality kicks in. One of my friends told me yesterday that the result isn’t clear cut because opinion polls have been shown to be wrong a lot recently – 2015 general election, EU referendum, 2016 US election etc. Neither of these things gives me confidence that the polls are wrong in a good direction. If anything, they are probably underestimating the Tory lead. So where are we? Jeremy Corbyn has seven weeks to convince voters of something he has drastically failed to do in the last two years – that The Labour Party is ready for government. And he’ll need to do it with the vast majority of the press against him. And Theresa? She might be awful when it comes to the good of the people but to give her her dues, she’s great when it comes to opportunistic power grabs. You might not like it but you have to admit, for a politician that cares only about power and cares nothing for the good of the people, it’s a fairly astute move. So, anyway. Do whatever you can with your vote to stop the inevitable but don’t get your hopes up. P.S. I stole the title of the blogpost from Adam Kay’s upcoming book, “This is going to hurt”. It’s probably the best book ever written and you can pre-order it now. He is one of the most fantastic people I know and I am so proud of him for writing it. The article is a fantastic example of how, no matter how bad the situation, politicians are able to rise above the usual constraints of fact, logic and evidence and carve out their own reality. It is, of course, an article in response to the report that found that the government, when selling off Royal Mail, had substantially undervalued it. In case you missed it, on the morning of 11th October last year, the government sold off Royal Mail. By the end of that day its value was £750m higher than that for which the government had sold it. It’s a bit like selling your car to your next door neighbour, only to find that, later on the same day, they’d sold it on to your other next door neighbour for much more. While we won’t get the £750m back from Royal Mail’s new shareholders, at least with this government, we can easily get it back through cutting benefits for poor people. Hoorah. Far from undermining the case against Royal Mail privatisation, today’s National Audit Office (NAO) report that suggests Royal Mail’s sell off was bungled actually convinces me that it the right thing to do. That’s some logic that only a politician could come up with – if the government hadn’t bungled it, he would have remained unconvinced on the whole affair. But because they did bungle it, he is now convinced it was a good idea. In fairness, it is being “interpreted” this way because that’s exactly what it says. The article then loses itself in a very muddle-headed analysis of what determines the value of a company. Essentially we are told, as the headline suggests, that the reason for the sudden and substantial increase in valuation was because the company was privatised. This just makes no sense whatsoever. A share price is essentially a measure of the market’s view on the future profits of a company. Occasionally a share price will increase substantially within a day but it happens when a piece of information becomes known that dramatically changes the market’s view of the future of the company. For example, if a pharmaceutical company announces that it has developed and patented a new drug that cures a common condition for which there was previously no treatment, then their share price might suddenly go up a lot. That’s understandable because the market expects their future profits to reflect this new piece of information. On the day that Royal Mail was sold off, their new private status did not cause them to develop, patent and announce a new, substantially more efficient, way of delivering letters. The increase in share price was simply because the government undervalued the company when it sold it off. So where did the money go? As we found out, a small number of investors in the City bought up a huge amount of shares and sold them on shortly afterwards, making hundreds of millions of pounds of profit. It really does take a politician to come up with the bizarre kind of argument given in this article to justify why it that money should have been profit for a few people in the City rather than money for the public purse. If the government were now holding their hands up and admitting their mistake, while simultaneously apologising to the poor people, whose benefits are now being cut, we could at least give them credit for being honest. Predictably (hey I can use that too), it’s smoke and mirrors time and if this is anything to go on, the government’s smoke and mirrors are looking thinner than ever. 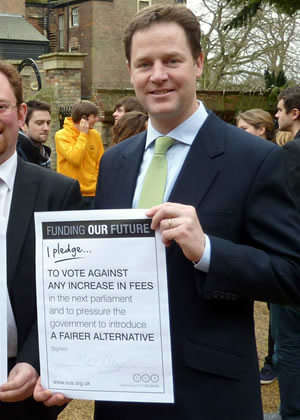 It’s easy to pick out Nick Clegg over such inconsistencies (in fact it’s fish, barrel, howitzer time) but this is undoubtedly a common trait amongst politicians. Let’s look at another. 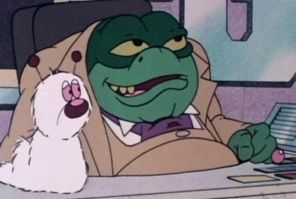 SNP Leader and Baron Greenback doppelgänger, Alex Salmond once described the pound as “a millstone round Scotland’s neck”. These days though he’s desperate to keep it. These days, we are told, that Scotland losing Sterling would cost British businesses hundreds of millions of pounds. It’s a pretty big change in his position, so it’s worth asking why that change occurred. Back to the question. Why has his position changed so much? Economically this is hard to answer. While different currency options have different pros and cons, those pros and cons don’t really change a huge amount over the long term*. When Alex was strongly in favour of Scotland scrapping the Pound in favour of the Euro, he didn’t mention those lost hundreds of millions of pounds that are now such a problem. Alex wanted the Euro when he thought it would gain him more popularity for independence and today wants Sterling for the same reasons. Not that that makes him any different to any other politician but it is important to understand that all of this has a lot to do with politics and not a lot to do with economics. In any case though Alex’s new found love for The Pound is fairly immaterial because, as we’ve seen, there seems to be very little motivation from the rest of the UK to enter into a formal currency union with an independent Scotland. While this has generated much ire from Alex, it’s worth putting this position into perspective. An independent country cannot demand than another country enter into a formal currency union with it Unless both countries want to do it, it won’t happen and, to be fair, it shouldn’t happen. Alex, as an expert on independence, should probably realise he can’t just pick and choose which aspects of independence he wants and which he does not. He might want The Bank of England to continue to act as Scotland’s central bank but, in the case of Scottish independence, that’s simply not a demand he can make. Given this, it’s surprising is that he doesn’t seem to have any “Plan B” on the matter of what currency an independent Scotland would actually use. With six months to go until the vote, this looks more than a little disorganised. So what are the options for “Plan B”? Scotland could continue to use the pound as their currency without any formal monetary union. Several countries already do this with the Dollar (hence the term Dollarisation for using a foreign currency), such as Panama and El Salvador. Several also do this with the Euro, such as Monaco, Andorra and the Vatican City. Scotland would be, comparatively, a very big economy to try this out but it is definitely an option. There are some serious disadvantages of it, one of the big ones being that if, as a country, you have no control over your currency, you can go bust. In this scenario, Scotland would set up its own central bank, print its own currency and have full control over both its fiscal and monetary policy. Unlike the other options, it would be economically independent. The down sides would be that the new currency was likely to be more volatile than the pound and there would be costs involved in cross-border transactions between Scotland and the UK when converting from one currency to another. There’s no reason to think that either of those would be an insurmountable problem though – neighbouring countries throughout the globe have used different currencies successfully for a very long time. Additionally markets wouldn’t panic about an independent Scotland using a foreign currency as they’d control their own, so Scotland would be able to borrow at reasonable (albeit higher) rates without being seen as a default risk. I really can’t see any reason why Scotland couldn’t do this successfully and it seems to me by far the cleanest and most workable (not to mention the only “independent”) of the three options. Is it about other economic things? No it’s not. An independent Scotland would certainly have the ability to operate successfully. Would they be on average better off or worse off? Despite what George or Alex tells you, I doubt there would be a big difference – there’s little evidence to suggest that things would vary much either way. Is it about political things? No it’s not. 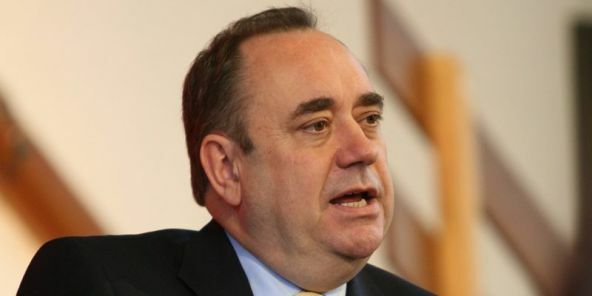 A “Yes” vote would mean Alex Salmond being in charge (and he is clearly a bampot), but a “No” vote would mean David Cameron being in charge and, if anything, he is an even bigger bampot than Alex Salmond. But that is politics for you – no matter how you vote, you’ll probably get a bampot. So if it isn’t about economics and it isn’t about politics, what is it about? Let me give you a hypothetical example to explain. Supposing there were clear economic benefits to the UK scrapping sovereignty and becoming the 51st state of the United States, would we all want to do it? I suspect that we would vote “No” and I doubt it would be a close run thing. As a Scottish person, would you feel happier if Scotland were part of the United Kingdom or happier if it were not? 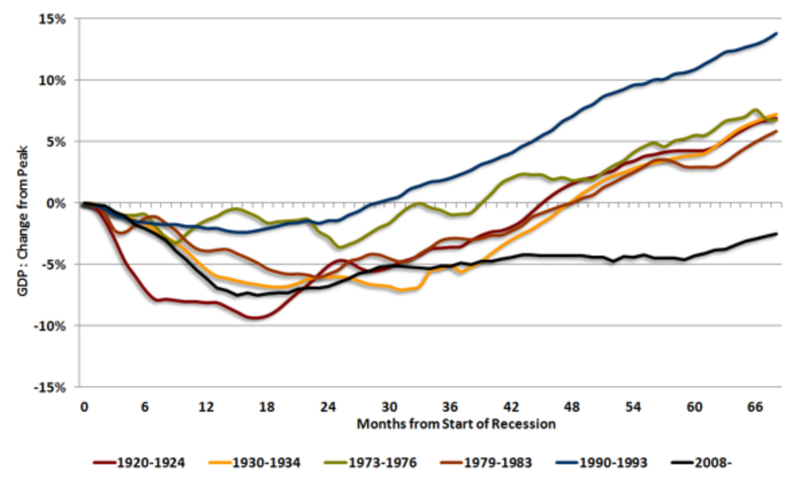 We can argue the economic and political details as much as we want. A question such as this goes way past economics and politics and it is essentially the question that will determine the way the Scottish people vote. I can’t help but add that I hope you decide to stay. * I say long term because in the short term pros and cons will change. Perhaps today being in the Euro would make people better off. Perhaps in six month’s time dollarisation would be slightly ahead. A currency choice is a long term option though and not something you can just keep switching every few months. Therefore the long term is where you should focus. As we enter another year under Conservative-LibDem coalition, there are many stories I could highlight as my story of 2013. I could talk about the UK’s credit-rating downgrade and how it underlines the government’s (willing or unwilling) misunderstanding of what determines their borrowing rate. I could talk about how the government should take no credit whatsoever for the signs of economic recovery we have started to see. I could talk about how the government’s policy on immigration is, at best, completely ignorant of the widely available evidence on the subject. I could even forget politics and economics and talk about taking photographs of herons if you want to give me a moment. However, in my current state of reflecting on 2013 whilst simultaneously looking to our future, there is one story that I feel needs to take precedence and that story is the story of inequality. 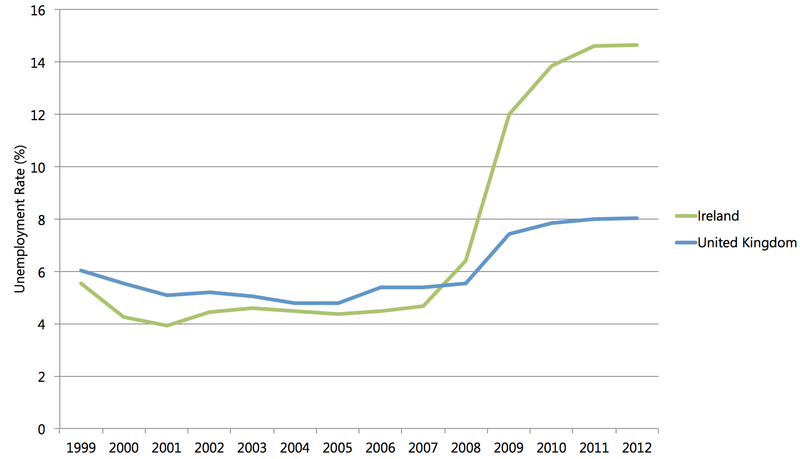 …the income gap between the top cornflakes and the bottom cornflakes is getting wider than ever. I stress: I don’t believe that economic equality is possible; indeed, some measure of inequality is essential for the spirit of envy and keeping up with the Joneses that is, like greed, a valuable spur to economic activity…. When Margaret Thatcher came to power in 1979 they faced a top marginal tax rate of 98 per cent, and the top one per cent of earners contributed 11 per cent of the government’s total revenues from income tax. Today, when taxes have been cut substantially, the top one per cent contributes almost 30 per cent of income tax; and indeed the top 0.1 per cent – just 29,000 people – contribute fully 14 per cent of all taxation…. I proposed that we should fete them and decorate them and inaugurate a new class of tax hero, with automatic knighthoods for the top ten per cent. Well, my friends, I am proud to say I have often been accused of being out of touch, but hardly ever have I produced so frenzied and hate-filled a response. People aren’t remotely interested in how much tax these characters pay. That does nothing to palliate their primary offence, which is to be so stonkingly and in their view emetically rich. When George Osborne gave his speech about welfare cuts in April, I labelled it the worst speech ever made. I didn’t expect it to hold that record for such a short period of time. Let me take Boris’s points one by one. In a free and competitive economy, the laws of economics say that workers’ wages are set by supply and demand. That is we would expect workers with skills for which demand is high compared with supply, to receive higher wages than their counterparts. If there is a demand for apples and I am better at growing apples than the average apple grower such that I grow on average 10% more apples each year, then I would expect my wages to reflect this. In fact, if my wages didn’t reflect this, I probably wouldn’t bother growing the extra 10% and instead work fewer hours. Therefore it is fair to say some level of inequality of inevitable in a competitive economy. However, that level of inequality is very far removed from the wage disparity that we see today. The wages received and the wealth held by the richest 1% dwarf that of the average worker by such a degree that it cannot be explained simply by the supply and demand of their skills. In 1998 the average remuneration of FTSE100 CEOs was 40 times that of their average employee. Just 13 years later it had ballooned to 140 times that of their average employee. This is the scale of inequality we are talking about and it is simply not explainable by supply and demand for skills – it’s not as if the number of people with the skills to be a CEO massively declined between 1998 and 2011. Something else is going on here. Firstly, it’s worth noting that the intelligence explanation of inequality is completely at odds with the explanation of our current government. David Cameron and George Osborne have for the past couple of years been pushing the explanation that people who do well, “go out and work hard” and being poor or unemployed is a lifestyle choice. That’s clearly nonsense but Boris’s explanation doesn’t work either. The gap between the super rich and everyone else has increased at such a pace that it simply cannot be linked to intelligence in any significant way. How can the dramatic rise of CEO wages in such a short period of time be explained by “different people have different IQs”? It can’t. Additionally it is worth asking why, if you accept that there is naturally a variation in ability, you should use that as a reason not to tackle inequality. Surely if you understand that some people are born with a natural advantage it is all the more reason to form policy to support those less lucky. Let’s look at a couple of other examples of inequality from the US and see if these seem to be linked to a variation in IQs among workers. In the US, the Walton family (I’m referring to the 6 heirs to the Wal-Mart empire not John Boy etc.) command a wealth of $67.9bn – equivalent to the combined wealth of the entire bottom 30% of US society. That must be one smart family! In case you think by using the example of one family I am cherry-picking, let’s go macro. This recent paper from UC Berkely showed that between 2009 and 2012, the earnings of the top 1% of Americans grew by 31.4% compared with just 0.4% for the other 99%. Or to put it another way, 95% of the increase in US earnings between 2009 and 2012 went to the top 1%. Can that possibly be explained by intelligence? No. Something else is going on. To a point. Going back to my original example, it’s a fair possibility that my apple growing neighbour will see my apple haul is larger than her’s and work hard to increase her output next year. As I have already stated though, this is just not the scale of inequality we are talking about and the idea that such a motivational effect exists when inequality is high is purely wrong. A small level of inequality might make me see an opportunity for increased wages by working harder but a high level of inequality will have the opposite effect. When a worker in a FTSE100 company sees the pay of their CEO increasing astronomically year on year, while their own pay stagnates, are they more and more motivated? Of course not, it is throughly demotivating. Worse still, those at the very bottom living in poverty see the gulf they must cross to get out of poverty becoming greater and greater and the chance of crossing it becoming less and less. In South Africa the rich live in luxurious, gated communities surrounded by razor-wire and armed security guards. The poor live around them in shanty towns. If extreme inequality is an extreme motivator then we should expect to see high numbers of South Africans that were born in extreme poverty moving out of it. But we don’t. The higher inequality becomes, the harder it is to solve. This one is half right in that Maggie did look out for the rich but the idea that she made things more fair or more equal is (in Boris terms) balderdash and piffle. 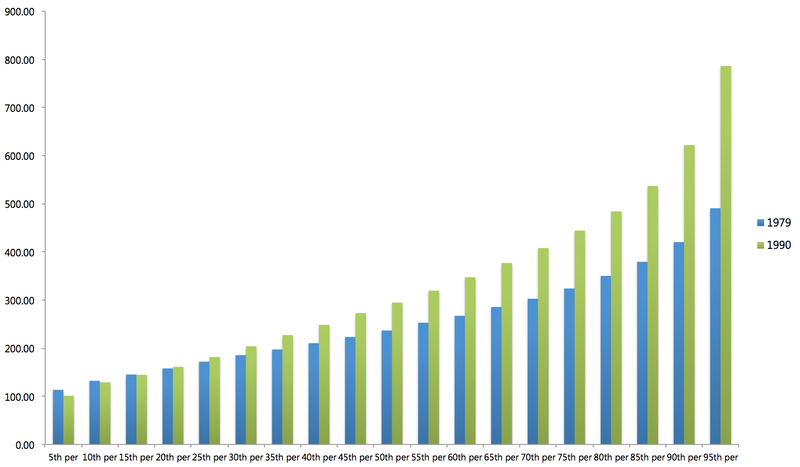 The Gini Coefficient is a standard measure of inequality in a country. A Gini Coefficient of 0 means everyone is equally well off. A Gini Coefficient of 1 means one person holds all of the wealth and the rest of the population have nothing. The lower the Gini Coefficient the more equal the society. This graph shows (in blue) how the Gini Coefficient changed during the period of government over which Maggie was in charge. 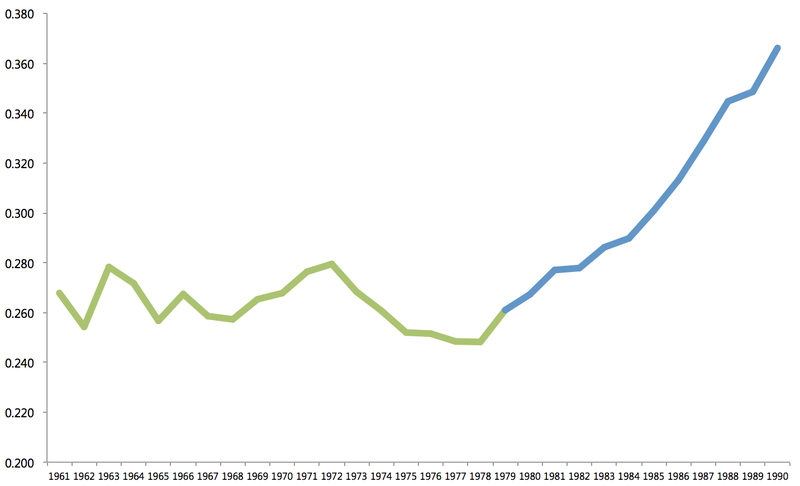 I’ve included the years back to 1961 (in green) to show that this wasn’t just an existing trend. As you can see the income of the poorest went down, while the richer you were, the more your income went up! If you give the rich all of the income, the rich pay all of the income tax. That doesn’t make it fair. This one might be the worst of the lot. A rich person who pays income tax (without trying any dodgy tricks to avoid it) is obeying the laws of the land. They are obeying them every bit as much as a poor person is who is paying their taxes. No one is paying income tax to be philanthropic – they are simply obeying the laws of the land as set by the politicians. More than that though, are we seriously trying to say that someone in severe poverty would rather be where they are now, watching every penny just to put food in front of their children but paying a small amount of tax, rather than being a millionaire who pays much more? I leave you to choose your own heroes here. Income tax is a government policy. It is they who decide who pays how much income tax. To say that heroism and knighthoods should come with the 45% bracket is worse than ridiculous. This is the always the last refuge of the right in this discussion. If you are concerned about rising inequality you’re just a nasty jealous person. This is not the case. The 99% do hate something but it isn’t the 1%. The 99% hate the system that sees the wealth of the 1% accelerating away from everyone else. They hate the fact that the same system that caused the 1% to go from rich to super rich simultaneously caused their own pay to stagnate. And they hate the fact that this system caused a global economic crisis for which they are paying the price. People don’t hate the individuals, they hate the system that causes the inequality. Why is it hugely convenient for right-wing politicians to push the case for the former? Because the responsibility of the latter lies solely with politicians and it is a system that those on the right seem to rather like the way it is. It’s easy to say that inequality is inevitable in free market economics but that is simply not the case. Inequality did not suddenly balloon under Margaret Thatcher because the laws of economics were different in the 1980s – inequality ballooned directly because of the policies of her government. Boris would like us to believe that the laws of economics exist in a vacuum but they don’t. They exist in a world dominated by politics. While the laws of economics help us to understand what the outcomes of different government policies might be they do not decide the policy that a government chooses to go with. Economics doesn’t define economic policy any more than economics decides the laws of the land. These are determined by politicians and those politicians absolutely have the power to reduce inequality if they choose to implement measures to do so. CEOs of FTSE100 companies are allowed to give themselves large increases in remuneration not because of economics but because the politicians have set laws on corporate governance that allow them to do so. Companies operate monopolies not because of economics but because the laws of the land set by politicians allow them to do so. Banks were allowed to lend irresponsibly in the run up to the financial crisis, not because of economics but because politicians relaxed banking regulations to allow them to do so. The problem with allowing inequality to increase forever might seem fine to Boris, (who we should remember, described his second salary of £250,000 for his Daily Telegraph column as “Chicken Feed”) but it has really serious implications. Today we live in a country in which a child born into a rich family has a significantly greater chance of receiving a high income later in life than a child of equal intelligence born into a poor or average family. That is not the sign of a well functioning society. We live in a country in which a child born into a family at one end of the income spectrum has a significantly higher life expectancy than a child born into a family at the other end. That is not the sign of a well functioning society. As I have said, the laws of economics do not exist in a vacuum. Our politicians have every opportunity to reverse this trend, not just by implementing controls at the top but also by investing seriously in state education in the poorest areas and reducing poverty, especially child poverty. We do not employ our politicians simply to tell us that it is “inevitable” that the profits from everything we produce should go the richest few. We employ them to look after every one of us, rich or poor, and don’t ever let them tell you that doing so is not feasible because of economics or free markets. Boris has his sights set on being Prime Minister. You have seen the rise in inequality that occurred under the leader he idolises and you have heard his abdication of political responsibility for inequality. One day he will run for PM. When he does, you know what to do. Long-term readers might recall a blog post I wrote a while ago that explained why the UK government could borrow money at such low rates while the economy was weak. The government’s explanation was that their austerity policies had given markets “confidence” in the UK economy. So high was the confidence their policies had created, we were told, that we were now able to borrow money at the lowest rates in history, despite an ongoing economic depression. If that smells a little fishy, it’s because it was. As I explained in that post, our low borrowing costs were a result of the market expecting short-term interest rates to remain low because they expected the economy to remain weak. 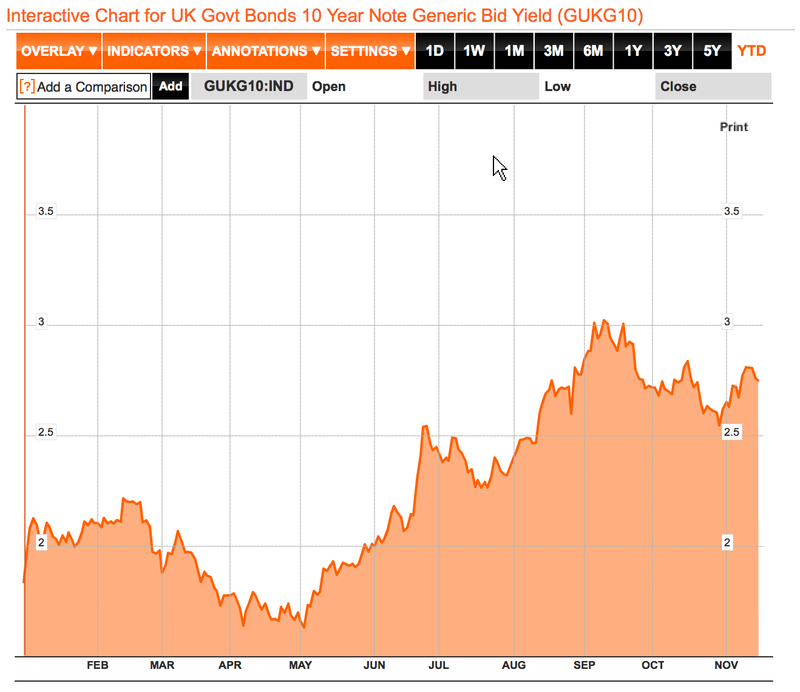 Only when the economy started to recover would we see UK borrowing costs going up. The government’s confidence argument was tested earlier this year when the UK lost its AAA credit rating, (the maintaining of which was one of the government’s key economic pledges.) If the government was right and confidence in the economy meant lower interest rates then this would, as they had repeatedly warned us, lead to a big increase in our cost of borrowing. I predicted the opposite would occur. And what actually happened? Yes, the cost of borrowing went down after we were downgraded. You might think that, after that, the government would have admitted that their faith in the Confidence Fairy had been misplaced. Well you might, if you were unfamiliar with our government. Moving on, over the past two quarters we have seen the start of an economic recovery. Yes, it has been the longest wait we have had to recover after any recession in our history but a recovery it is nonetheless. So what would the government’s explanation of borrowing costs driven by confidence predict? It would predict that as the economy recovers, confidence would increase even further and borrowing costs would go down. And what would my explanation of borrowing costs driven by expectation of future short-term interest rates predict? As the economy recovers the expectation of higher future short-term interest rates would cause the government’s borrowing costs to go up. If you favour the argument that low rates are all about confidence then explain to me why the cost of borrowing increased significantly during the period that the economy started to recover. The confidence argument was, of course, nothing more than a means to an end – a manufactured tool to scare us into thinking that austerity during the bad times was a necessity. In a country like the UK, with control over its own currency, the confidence argument had no economic basis whatsoever and now we have the evidence to prove it. The confidence argument was a lie. It really is that simple.